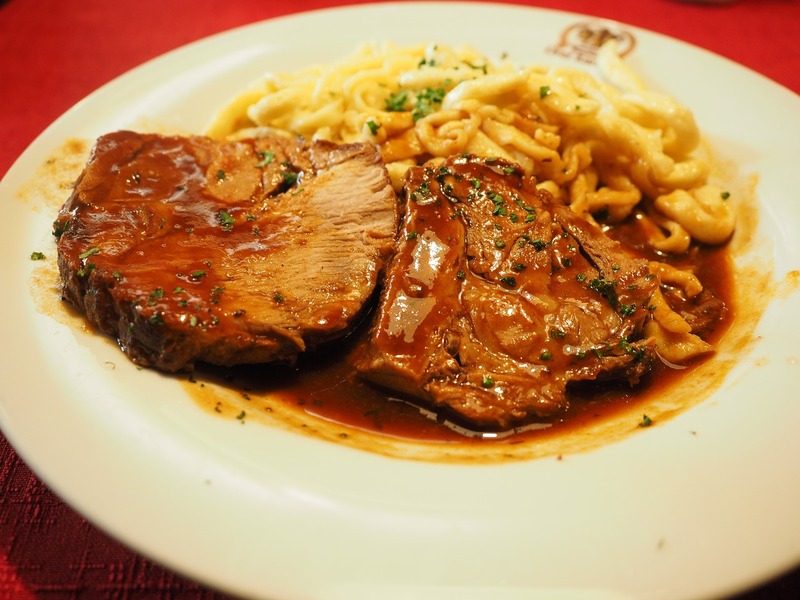 The authentic German pork roast is a traditional German dish that you can find in any good local German Inn or as we call it in Germany a "Gasthof". Back in the 50s or 60s many families that lived on the German countryside would have their own little farm with a barn, pig stable and a chicken coop. This little farm delivered almost everything what they needed at this time, plus they had also a garden and some fields for potatoes. Pork, potatoes, fresh milk and eggs - sustainable and viable. Once a year a pig was butchered by the local butcher. Sausages would be made freshly the same day and the meat prepared to be smoked. Such an event was called "Metzgete" - there is no really English word for it but it comes from the word "Metzger" who means butcher in English. The products of the Metzgete are also offered in the Inns of Germany's South as a specialty. They would serve the fresh sausages and a special soup and of course the meat on a "Schlachtplatte". It contains liver and blood sausages, sauerkraut and pork knuckle. The authentic Geman Pork roast is a dish of the "Gutbuergerliche Kueche" which means "home-style cooking". Now that you found an original and authentic German recipe you are able yo make it in your kitchen wherever you are. Happy Cooking! - Wash the meat thoroughly with cold water. - Rub the meat thoroughly with salt and pepper. - In a big pan heat oil or lard and fry the meat briefly but good, the pores of the meat have to close so the meat won't dry out during the long cooking time. - Place the pork in the middle of the baking tray. - Peel onions and cut them in slices; put onions next to the meat. - Make the broth per instructions and add app. 125 ml over the onions and add 1/2 liter water. - Let the pork roast cook in the oven for 3.5-4 hours on 350 degrees F.
- Turn the meat every 30 minutes and pour some liquid from the tray over it. Don't let it dry completely. Serve it either with mashed potatoes, Spaetzle, or Knoedel (dumplings) and red cabbage. It's great with potato salad too. Find the recipes for Spaetzle or dumplings on this website. In a saucepan melt 3 tbsp butter. Stir in 1-2 tbsp cornstarch to butter and let brown for one minute, stirring frequently. Add pan broth to butter and flour mixture. If you like add some red wine. Spice with salt and pepper to taste. Allow gravy to cook for three to four minutes or until it thickens. An additional tablespoon heavy cream adds some nice creamy flavor.